Two things have changed in my life so far since becoming a mom. The first, it’s always going to take at least an hour for me to get out of the house now. The second? Getting my nutritional needs on target each day is a lot harder now. Eating when I’m hungry isn’t always a possibility. And, if it’s not something that can be made, or held in one hand to be eaten… It’s a no go, because it’s not exactly easy. Protein is such an important part of a daily diet, especially when you’re a nursing momma. 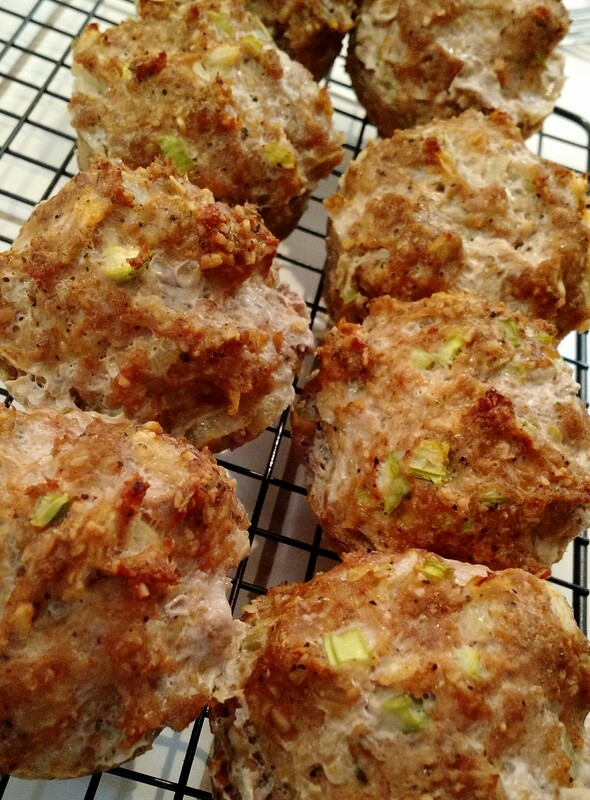 My younger sister had made a lot of Jamie Eason’s recipes from her Live Fit trainer when she did the program, and suggested the Turkey Meatloaf Muffins. Looking the recipe up on BodyBuilding.com, 20g of protein in each muffin? Um, yes please! I gathered all of the supplies today, and with baby strapped to me in the Moby carrier (he was, of course, feeling needy for momma when I needed both of my hands), made my first batch. Since I only have one 8-muffin tin, I had to technically make two batches. Which was convenient. Being super hungry, with said needy baby in hand, the second one from the first batch cooled, I taste tested… And holy cow these are good! Directions: Preheat oven to 375-degrees. Spray muffin pan with olive oil, then mix all of your ingredients together in one large bowl. Roll mixture into balls and put them in the muffin pan (muffins should be the size-ish of a racquetball). Bake for 40-minutes. The recipe makes 12, but I got a baker’s dozen of good sized muffins.